Taylored Expressions 9th Birthday Release! Welcome to Taylored Expressions September release! This month is also Taylored Expressions birthday! Its TE’s 9th Birthday. Wishing Taylored Expressions a very happy birthday and many more birthdays to come. Today is day #1 of the September release and I am sharing with your two projects using two new soon to be released products. The first one uses a new background stamp called Free Fall. I love this design. Such a versatile stamp. This design can be used to make background for any themed card and so many techniques can be used to make gorgeous backgrounds. 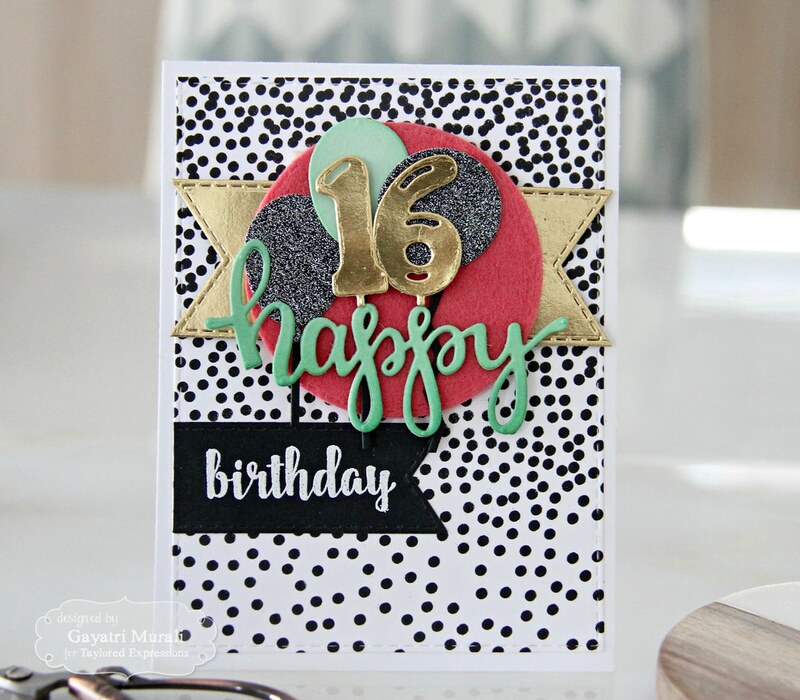 On my card below I used gold heat embossing to make a birthday card. I gold heat embossed the Free Fall background on Sugar Cube stitched rectangle panel. I adhered this panel on Toffee card base. 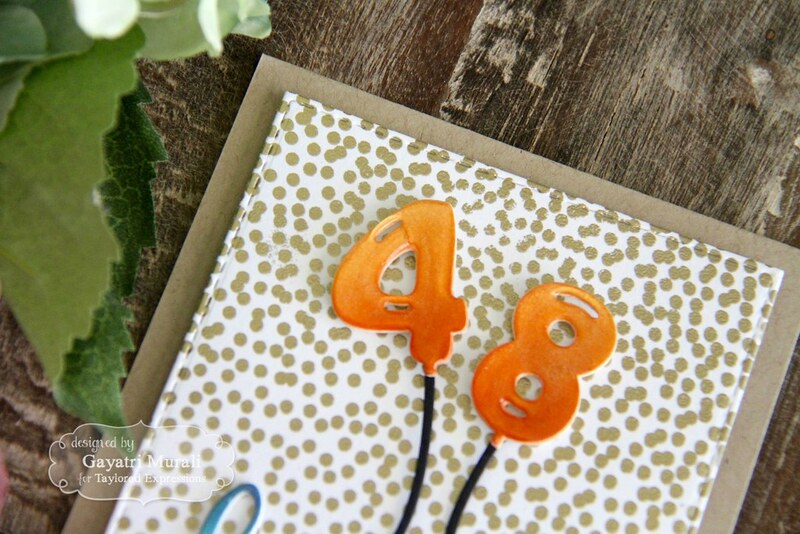 Then I die cut the 48 balloon numerals using the new Number Balloon dies. I sponged Lemon Meringue, Candy Corn and Pumpkin TE dye inks on them and a good coat of glossy accents. I left them to dry. 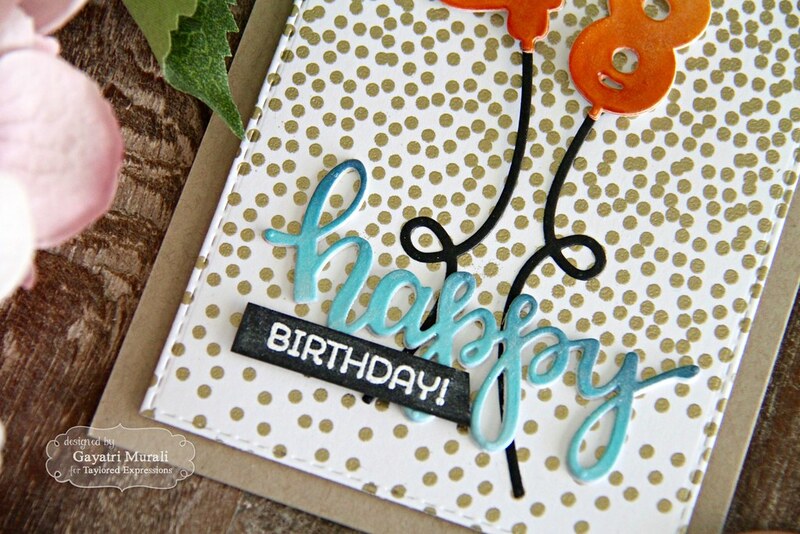 The strings for the number balloons are die cut using Oreo cardstock and Balloon Strings die. For the sentiment I die cut the Happy Script die three times using Sugar Cube cardstock. Stacked glued them and sponged Cookie Monster and Blue Corn TE dye inks on them. I adhered the number balloons on the Free Fall background panel using foam adhesive, the string glued to the balloons. Then the Sponged Happy Script die cut and secondary sentiment is white heat embossed on to a strip of Oreo cardstock. I brush clear shimmer on the Happy Script using Wink of Stella Clear Shimmer pen. All the supplies using the make this card are listed below. 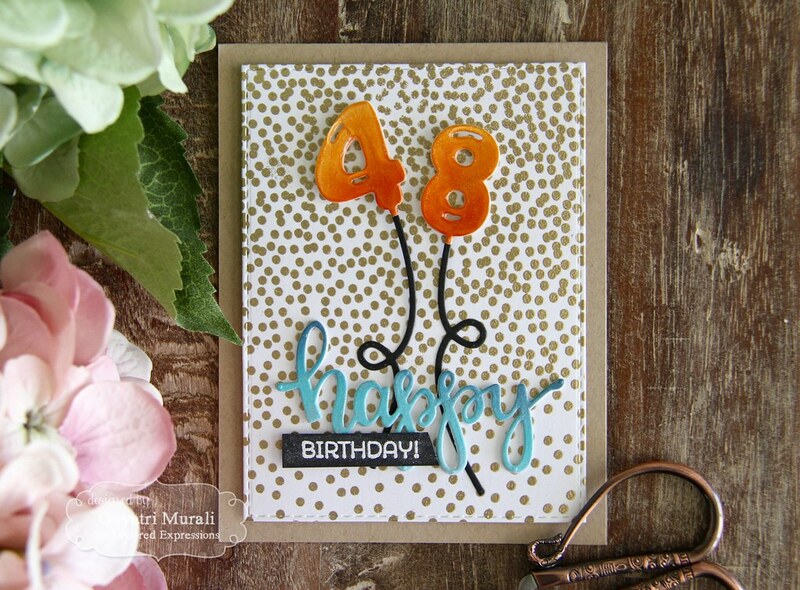 On this card I used the Free Fall background using Pink Champagne TE dye ink. I then diecut a circle on the bottom of the panel. I adhered this panel on to a Sugar Cube card base. The focal image is the Iconic Wishes Birthday cupcake. I stamped the wrapper using Mint Julep TE dye ink and again with versamark over it to clear emboss the image. Using MISTI for this step make life easier. Similarly I did the topping of the cupcake using Chocolate Truffle TE hybrid ink and versamark to clear emboss. The sentiment and the cherry on the topping is coloured using copic markers. I die cut the cupcake using the coordinating die and adhered inside the negative circle using foam adhesives. 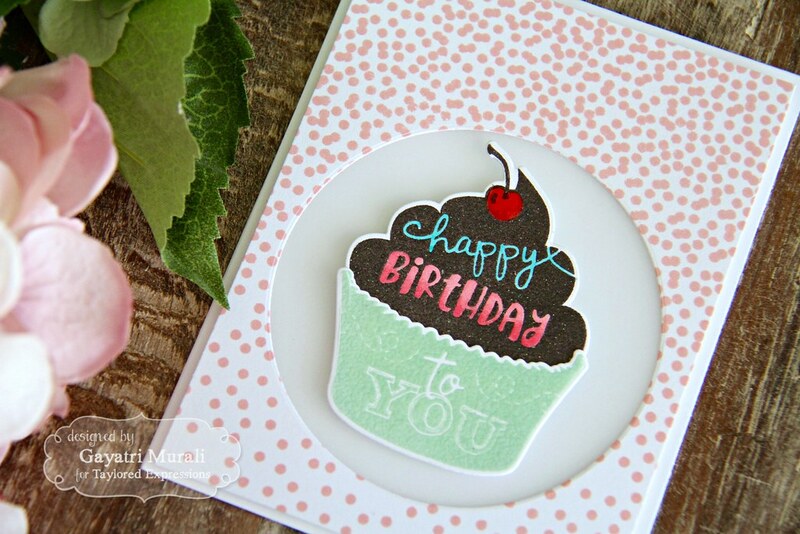 Simple card but the colours pack a punch.I added glossy accent to the cherry. No other embellishments. Hope you like my projects. Head over to TE blog for more inspiration from designers. Here is my take on the sketch using some new release products. Here I used the Free Fall background in black for a dramatic effect. And kept the colour combo very trendy. For texture I used TE felt in Flamingo colour and glitter paper for the balloons. I added gold foil on the number balloons and the fish tail elements. 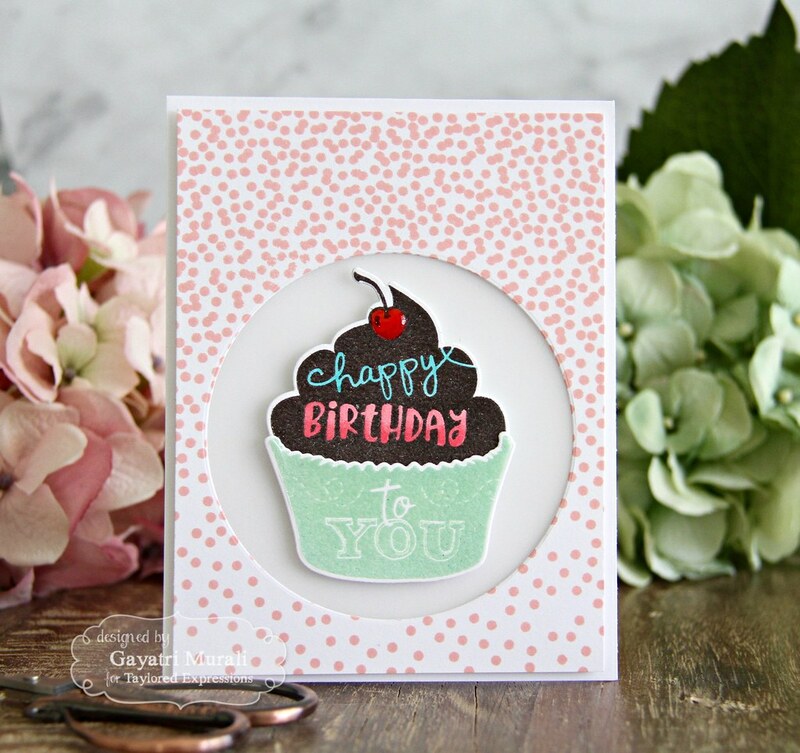 The main sentiment is the new Happy Script die die cut in Mint Julep and secondary sentiment is white heat embossed on Oreo cardstock and die cut using the Stitched Banner Stacklets.On the whole the colour combination makes the card look trendy. All supplies using to make this card are listed below. Check out Taylored Expressions Blog for more details. I will see you tomorrow with day #2 sneak peeks of the September release. Thanks for stopping by my blog today. I love the balloon numbers especially in gold! It really makes them pop with the black balloons in the background! That background stamp is pretty amazing, love all your cards!! I am really loving the cupcake theme! So pretty and happy! And I love that happy die cut, such a nice font!! 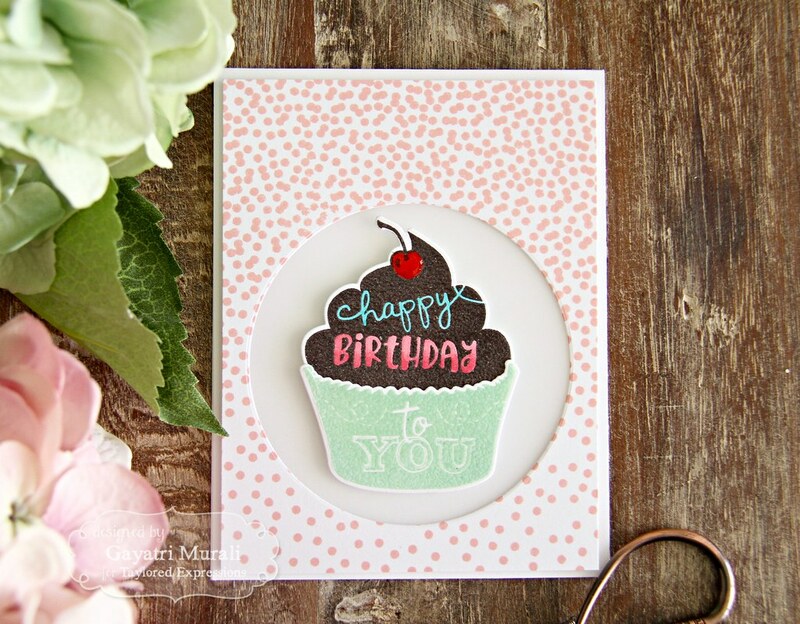 Fabulous birthday cards with this free fall background. 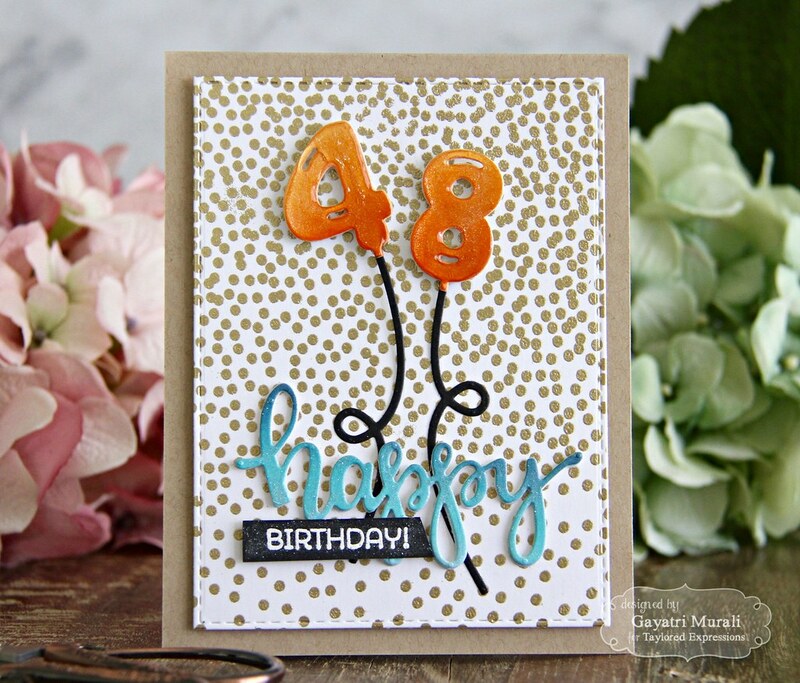 Absolutely love the color combinations on the happy birthday cards. The happy 16 card reminds me of a retro soda shop. The designs are so clean. Thank you for these amazing, and inspiring, ideas!! Super sweet cards!! 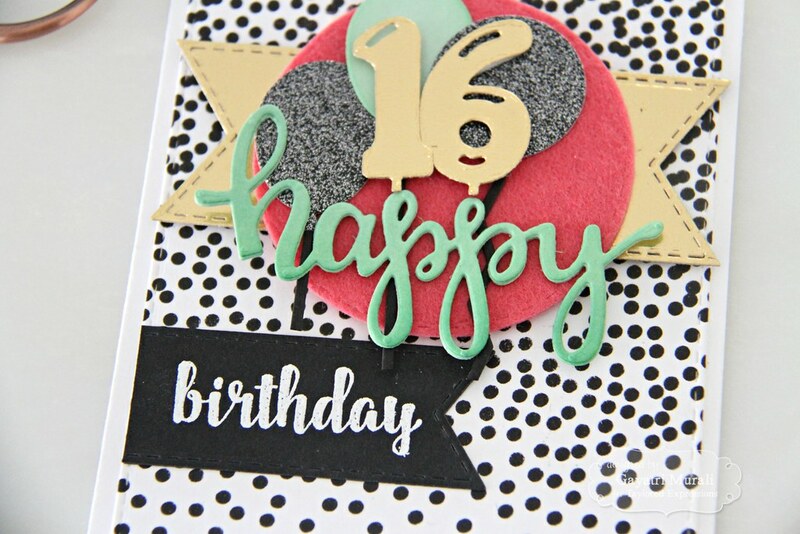 I especially love the color combination of your sweet 16 card – the mint green really makes everything pop! fabulous birthday cards! Love the glittery and gold balloons!! 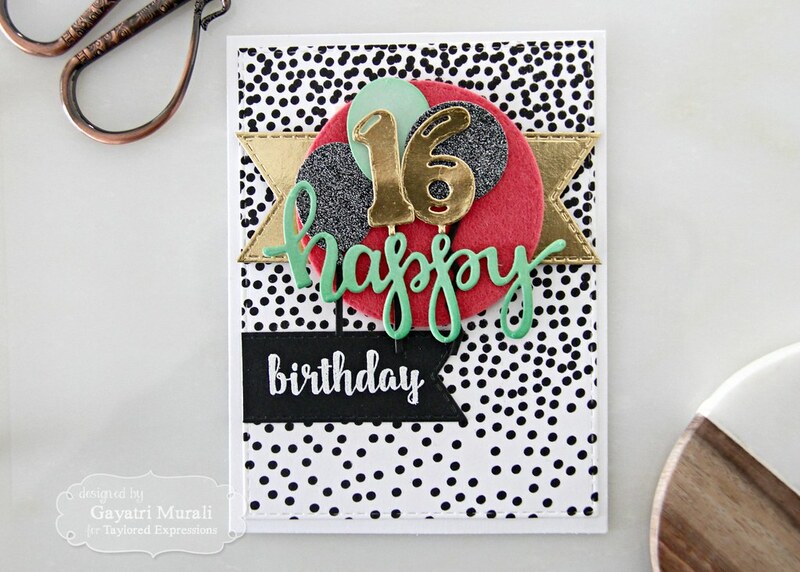 Love that background stamp! Cute cupcake too! Love your festive cards!